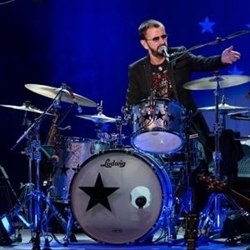 Who doesn't love Ringo Starr? . Beatles Radio: The Beatles, Solos, Covers, Birthdays, News The Fab 4 and More! Who doesn't love Ringo Starr? Who doesn’t love Ringo Starr? The former Beatles drummer, longtime solo artist, double Rock & Roll Hall of Fame inductee and newly minted Knight Commander of the Order of the British Empire has become a kind of mascot for the ’60s and its “peace and love” ethos. The phrase is his mantra and a concept he takes seriously. Over the last three decades, Starr has found a way to manifest those aspects of his personality into a concert experience with his All-Starr Band extravaganzas. They are good-time guitar pulls writ large, with Starr as the ringleader, emcee and focal point whose ego doesn’t prevent him from getting behind the drums occasionally and supporting his friends.